We don’t live in an area where many languages other than English are spoken, so my task is extra difficult. But considering the incredible advantage a bilingual adult has in an increasingly interconnected globe, I think the effort is worthwhile, whether Baby J grows up to be a businessman or a missionary. Is it possible to raise a semi-bilingual baby when neither parent is perfectly fluent in a second language? My “bilingual” baby is only 8 months old right now, which means he can make a few sounds that readily work in any language. Blah, blah, blah / ma-ma-ma / ba-ba-ba. Just for fun, check out my infographic at left showing the variations of ma-ma that are used for mother in 90 languages. Babies start out with the ability to learn any language. By 12 months, the ability to hear certain consonants disappears. By exposing children to the sounds of another language at an earlier age, you may improve his later accent/ability to learn that language. There is a caveat to that theory, though: read about this study done by the University of Washington. It suggests that brief exposure of infants to Mandarin helped them hear the unique tonal sounds that otherwise they would not be able to distinguish. But it also shows that babies tuned out artificial sources of the language much more than when they had actual humans speaking to them in Mandarin. So just playing your baby music in Mandarin is not enough. Best case scenario: One Parent One Language. (Or minority language spoken at home, English at school.) In our household, One Parent One Language would mean David speaks only English to J while I speak only Spanish. David and I would like to use this OPOL model, but there’s one tiny/huge problem. It’s more fun and easier for us to both interact with J when David can understand what I’m saying. (He only knows a few words/phrases in Spanish.) So, realistically, I often speak English to Baby J when David is home. And there’s another problem: my English is much better than my Spanish, so sometimes I have to switch just because I don’t know how to express myself in Spanish. I have a feeling this problem will manifest itself much more when J is older and able to ask questions. So how are we going to try to make our experiment work? Can 2 English speakers raise a bilingual baby? 1) I will be speaking Spanish to Baby J as much as possible. 8 months old would not have been too old to begin, but the earlier, the better. 2) We will make our home as bilingual as possible. Baby J with his favorite book. By that, I mean a couple of things: we will try to read to him regularly from children’s books in Spanish, and we will play Spanish music and recorded speech. (See my next post on resources we are using or will be using to accomplish this goal.) Every night since J was only a few weeks old, I have been reading him a Bible story in Spanish as part of his bedtime routine. Why Arabic and Mandarin? 1 – They are the languages of huge people groups (although Arabic is divided into multiple dialects). 2 – They are widely spoken in something dubbed the “10/40 window.” Unfortunately, I can’t speak more than a couple words in either language. 3) When J is older, we will try to find ways to let him experience his second language spoken outside the home. There are a very few native Spanish speakers in this area, and I would like to meet some of the mothers and trade English lessons for Spanish lessons. I’d be getting to teach ESL again, learn more Spanish, AND expose Baby J to conversation with native speakers. J is much more likely to want to actually speak (not just listen to) Spanish if he has a Spanish-speaking peer group. If this is impossible, we’ll wait until he’s a little older and set up a language exchange for him. 4) In homeschooling, I will attempt to teach some things in Spanish. This is a very lofty goal, and one that will take some great dedication to achieve. I want to put a question mark afterward, because I know that it may prove nearly impossible for me. By the way, maybe you’re thinking, “Why don’t you just let him go to a language immersion school for a half day when he’s older?” That means that you live in a much bigger and more multicultural city than we do! I loved seeing all the different language options in the schools in Houston! As we think through the ramifications of trying to raise a bilingual child when neither of us is perfectly bilingual, we face some inevitable questions. Will we teach him to read in English or Spanish? Spanish is much more logical and easier to teach how to read. Starting with Spanish, though, may prove a disadvantage to J. English is the more difficult language he will have to master if he wants to do well in college or everyday life here in the United States. I want to help J memorize both Scripture verses and the shorter Westminster Catechism. Which language will I teach them in? Right now, I’m leaning toward teaching the Scriptures in English. (He’ll use them most in English in the foreseeable future.) I’m considering teaching the catechism in Spanish, since there aren’t currently any church programs for working on the catechism. But it’s something David and I will have to discuss more. It will be much harder for David to encourage J in his catechism-study if he doesn’t understand either questions or answers. Should I refrain from speaking Spanish to J when we are with others who don’t understand it? It may appear rude to speak a language the others around us can’t understand. But when J is little, he may understand most instructions, etc. in Spanish, simply because he spends more time with me than David. (I’ll be interested to see if this is true!) I’ve found, also, that one of my family members resents my speaking words he can’t understand to Baby J. I can understand that not being able to understand makes one feel “shut out,” even in a conversation with a baby. 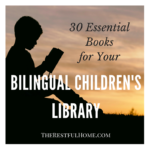 Are you interested in creating a bilingual or multilingual environment for your child? What are some questions or issues you have to work through with your family/your child’s other parent? Interested in seeing the books/CDs I use with Baby J? 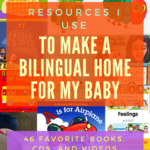 Read this article about resources we use to try to make a bilingual home.